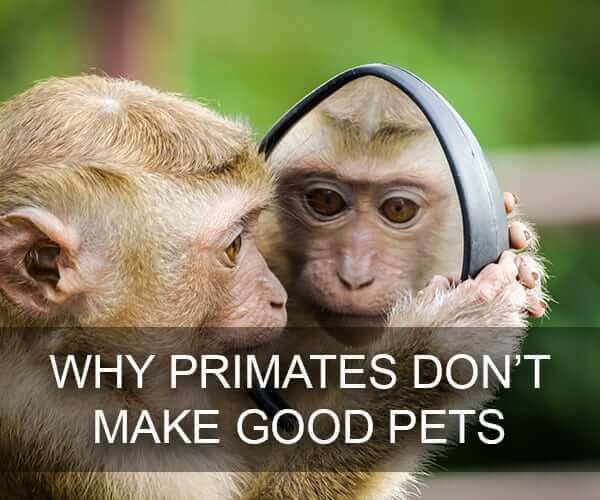 But are primates really a good pet? You might think they are because monkeys are biologically pretty similar to humans. That’s about where the similarity ends, though. Unfortunately, primates are terrible pets – they are meant to be in the wild, not captive in our Little Rock homes. As a vet clinic, we have to be honest. Here’s why you don’t want to own that cute monkey or lemur. Because they are small and cute, people often think having a monkey is like having a baby. They’ll even dress the monkey, put it in a diaper, and more. Unfortunately, primates are not a good substitute for human children. People who bring monkeys to a vet clinic insist that they keep their monkey plenty of company. Unfortunately, what they don’t realize is that primates in the wild live together in groups of 20 – 50 individuals. Even smaller primate groups consist of 8 – 20 individuals. These primates are together constantly, playing, eating, grooming, and living. When you have a pet, you aren’t able to give them this level of interaction. Even a large family can’t all be present every moment of the day. Keeping a primate alone with you or your family strips them of the natural play and social interaction they need, which can lead to them acting out. Like many animals, primates have emotions and struggle when they are out of their natural environment. When a primate is kept in a home, it cannot roam, socialize, explore, and interact with the environment the way it needs to. In the wild, monkey cover many, many miles a day. They climb high into trees and swing between them. They communicate with their family pack, find and share food, and much more. As a pet, this stimulation is missing. This can cause them to become depressed, aggressive, or develop other behavioral problems. There is no way to prevent this in captivity, even with the best vet clinic. It’s best to simply not keep them as pets. Remember how we mentioned earlier that primates are very biologically similar to humans? This means that there are a lot of transmissible diseases that can make you very ill. Primates can carry Herpes virus-B, monkey pox, yellow fever, tuberculosis, Hepatitis A, and HIV. They can also get sick from humans, which can require an emergency trip to a vet clinic. Beyond illness, monkeys can become aggressive and are often very strong, even if they are small. When they are kept in confined conditions outside of a natural habitat, they can go on a rampage without warning. They don’t have the moral compass or social norms we do, and they can hurt you very badly. Choose the Right Pet and Bring it to Our Vet Clinic! At Bowman Road Animal Clinic, we love treating your pets. We want all humans and animals to be in a safe and happy environment, which is why we cannot recommend primates as pets. If your cat or dog has fallen ill, or just needs an annual checkup, let us be your Little Rock vet clinic. You can contact us to set up an appointment today!